The basic intentions of art and economy are opposite. If there is given an ego oriented intention then the content-related conveyance and the altruistic way of thinking are reduced until they finally completely disappear. On the other hand if there is an altruistic way of thinking and the intention to convey content-relatedly then the ego loses the consideration and the form-focused way of acting is reduced. Due to a complete economization of the arts during the last years and an increasing impossibility to avoid the confrontation with the ego focused and the form focused way of thinking in urban regions due to the circumstance that media like for example televisions, advertisements and warning signs are findable everywhere there is hardly still the possibility to keep the altruistic and the contentrelated way of thinking. These ways of thinking can only exist when autistic capacities and the esoteric kind of being uninfluenceability are parts of the character. Unfortunately this esoteric kind of being does not belong to a human being but it belongs to an above being. With the presumption of sensing empathy there develops an inner willingness to give. Making gifts opens potentials in the fourth level of consciousness if there is no expectation to receive in return. Empathic capacities can develop when the gift is made with an honest inner conviction. Becoming empathic with another person causes an object-related way of thinking. If making gifts is made without the expectation to receive in return and if it is made with an honest inner conviction and the focus of attention is on the object then there exists an altruistic attitude. A boy is at an age of three years. He eats a chocolate bar. Another boy is close to him. Without being aware he takes the half bar and he gives it to another boy. Then he goes away again. If there happens the self-awareness in a human then the basic intention of a human’s action is egocentric after the axiom of economic sciences. David Hume’s axiom of economic sciences assumes an excessive and egocentric world view. An egocentric world view reduces the voluntary and object-related gift. The voluntary and benefit-oriented effect of the axiom and the scientific system that develops from it increases the exclusion of empathy that is truly perceived and it results in an exclusion of an altruistic way of thinking. A human who always wears richly coloured clothes in his private life wears a black jacket and a jeans that he finds unaes-thetic having the aim to demonstrate a public image in front of a contract partner because he wants to receive a respect from him that he needs to let the business become successful. While they make the business he consciously uses the public persona. The trade is successful. When a benefit-oriented way of thinking is connected with demonstrations then there takes place a distortion of the reality and many sins are made with only one action. The demonstration of a public image has not only become a social convention but it has also become a social obligation that decides about the professional success. If these sins are not made then there can not be a professional success. In this example the performance is misunderstood as a pretending and a lie. Furthermore there takes place a fascism in this example. If the man had worn his colourful and wide clothes using the public persona then the trade would have become successful with the less probability. Due to these opposite intentions the artistic being reduces the economical way of thinking and the other way around it is the same. Yet the economical way of thinking uses the means of the arts for their own benefit and it defines the demonstration as a performance. The demonstration is one of the sins of religion. Thus the wrong use of the term performance results in a general social obligation to sin. The term justice was originally derived from esotericism by philosophers. A continuous cosmic compensation between powers of a coherent cosmic system that aim the state of powerlessness was seen as a world order. This compensation between powers was treated in many philosophic contexts. The law of karma in presence and in future life, the evangelic believe in justice that takes place after death due to the accomplishments that had been made in life and the term justice after Plato where justice is a function of the soul are some examples. 4 There was e.g. the goddess Maat who was connected with the principle of justice that was a world order in the ancient Egyptian mythology. In the ancient Egyptian believe the goddess was placed in the sky and not on earth. For this reason the principle necessarily had a cosmic origin. The intentions and methods that are used in economy make it impossible to let justice rule considering the definition of the term justice that is derived from esoteric laws. The attitude of excessiveness by reaching ones maximal benefit makes a fair balance between giving and receiving impossible. It results in the exploitation of the accomplishments and the works of those individuals whose intentions are not benefit-oriented. On the basis of an egocentric world view altruistic actions are declared as “impossible and unfindable”. This argumentation leads to a reducement of making gifts that do not receive anything in return. There is finally also a fair balance between making accomplishments, working and receiving in return destroyed by a too high wage that is given for the shape and the presentation of a working product and a too low wage for the labor value and the quality of the work. In many social contexts I gained the experience that humen understood justice as a good and nice life with material prosperity without knowing any theory of justice. In their opinion the prosperity and the life in justice could only develop when somebody has either lived with material prosperity from his birth on or if somebody has reached that much prosperity that he can live with it until the end of his life. The fair life could only be when the intentions of economy are already recognized and the economical methods are already used. In their opinion a fair life could only be reached from an economical perspective. For this reason only those people who make the maximal benefit out of possibly little accomplishments without considering the dignity of other humen could have a “fair” life. In my experience those people who have used economical methods their whole life long are in general not loved anymore and they are only treated with “sympathy” for their social status and prosperity for the duration that they have prosperity and a high social status. The false believe that a material prosperity causes honest respect, appreciation and love goes together with the missing realization that the satisfaction of ones needs will only finish with the end of the life and true justice will never take place. The principle of compensating powers is not findable in this theory of excessive maximization. Those individuals who have no benefit-oriented intentions but much more an altruistic way of thinking or even an altruistic need can not have a fair life in this theory because they will not reach the material prosperity that they would reach with economical methods. Furthermore the economical philosophy assumes a materialistic world view that excludes charity, inner values like for example trust or social cohesion for another person’s self and it excludes the inner maturation process. Becoming an adult and a mature human becomes difficult when the economical methods are used. In reality this understanding of justice often leads to loneliness due to the egocentric and benefit-oriented way of thinking and relations are not honest anymore like for example a relation that only exists because a human only wants to have his own advantage from the reputation or the social status of the other human. The result of reaching ones own maximal benefit is a respectlessness for the needs of the other individual. With an increasing recognition of “justice” in an economical understanding those humen who have an altruistic way of thinking become always less until they are finally destroyed. After many years of the effect of the economical way of thinking in many institutional and social contexts like for example the internet and educational institutions this social minority only still exists in the memory. The Christian god who was conveyed to the humen by Moses to spread human charity has become a metaphysical god and a god of independent self-realization due to the trend of medieval philosophers. The human who should now be “in the center of the developments” being an autonomous living being has founded a new religion that is called capitalistic fascism. 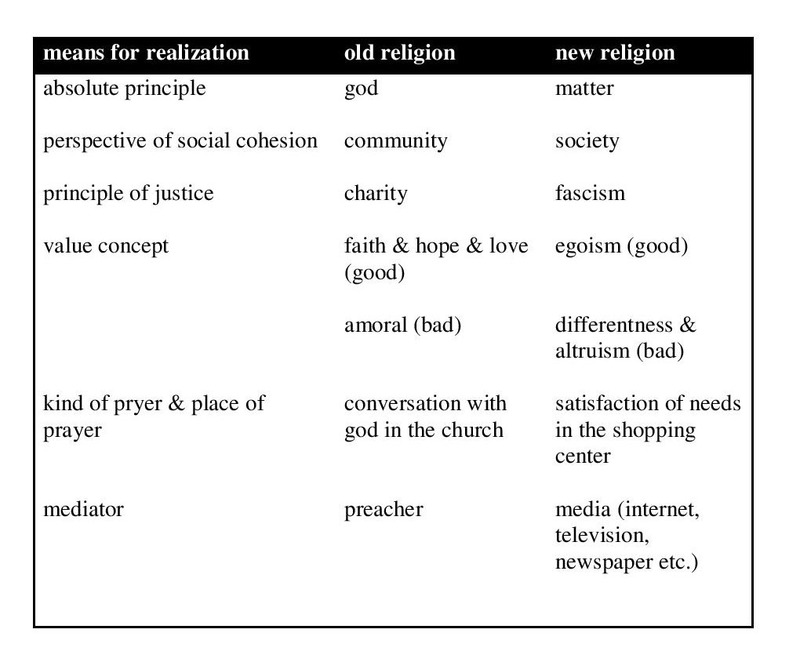 The god and the “values” as well as the institutions are conveyed in the table. A new spirit of time has started. The god is the matter. The daily prayer is the need satisfaction (food, clothes, sleep) that are findable in real and virtual shopping centers. Therefore the churches close. Values do not exist. The old values will be replaced by egoism. The golden house will become a reachable goal. The preachers are the makers of advertisement that is findable in privacy and public. The economists make the prophecy of a “good” life in “justice”. 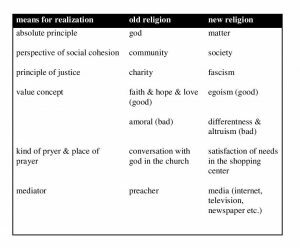 The increasement of ones cognitive capital until the end of the life lets the humen of an “advanced” society arrive at the next level of recognition by a new “religion”. A believe without values is no believe but a worship of matter. The worship of the valueless devil in the matter brings the hu-men back onto the lowest level of recognition and the adult and spiritualized humen as well as artists are destroyed. A country without values and with the lowest level of recognition has no culture. If there are worships of the matter and together with the matter worships of valuelessness then culture will be destroyed because culture only exists when values and the inner maturation process is given inside the humen. There are worships of the wrong object and the humen lose always more the relation with their inner being. Intelligence, the inner maturation process and inner values become a memory of the past. There has often been made the comment in past that there are hardly still cultural differences. When making these statements there is not considered that there are little exceptions of people with the inner maturation process who have consciously retreated from the social happenings. The cause for an advanced absence of cultural differences is hardly reflected. It is connected with the destruction of the inner maturation process due to the worship of the matter, the economical philosophy and the destruction of the values in the inner beings. Due to the assumption that a person is not professionally es-tablished the person is discriminated. Her dignity that was great due to the circumstance that she was Aryan was not recognized. The dignity of a student at the free university Berlin is violated several times in lectures by rejecting nonverbal and sexual treatments. She is treated like a prostitute though she has not made a verbal or a different kind of a sign in before. Due to the assumption that a person is not professionally es-tablished the person is discriminated. There had neither been a knowledge about the accomplishments that a person had made before nor had her dignity that had been that of an Aryan been recognized. Several teenagers are degraded by a teacher in school. “You can do everything with them cause they have reached nothing so far.” The teacher obviously demonstrates a feeling of self-made superiority when speaking as if the pupils were inferior. Due to the assumption that humen have not made any accomplishments or worked in past they are degraded. The wrong conclusion results in the permission to treat other people inferior.